Connect Instantly with Prospects Looking for Insurance. Quotecalls from Contactability are high intent inbound insurance calls. Each call is pre-screened and live transferred to your office phone. All you have to do is answer the phone and quote the prospect! No minimums, contracts, or long term commitments. 100% exclusive calls sent to you and YOU only. 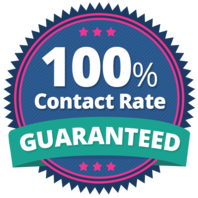 100% contact rate. QuoteCalls connect you with live prospects who have been individually screened and are ready for a quote. Make Your Phone Ring with Qualified Prospects. With Contactability QuoteCalls you don’t have to play the Mad Dash of trying to reach the prospect before anyone else. All you have to do is answer the phone. We provide full control of your call flow, with our agent friendly user interface you can chose when and how to receive your inbound calls. Select your desired hours of operations, concurrency caps, max per day, risk filters and your agency phone will only ring when have your “perfect prospect” ready to talk to you. You only pay for calls that are over 90 seconds. Answer the phone and speak with the prospect! Did you know that inbound insurance calls close at a rate of 10-15% higher than traditional leads?